Dubrovnik's food scene is pivoting from tourist traps to a genuine taste of Croatia. Yvonne Gordon tucks in. The huge fish sizzles and smokes on the heat of the grill, a simple rack set over charcoals. It's lunchtime at Škerac restaurant and they're cooking us a large dorada, or sea bream. The restaurant's tiny stone terrace overlooks a small beach, where three red kayaks rest on the sand - abandoned while their occupants have lunch here. Beside the beach, a stone jetty leads into the clear blue and green Mediterranean water where the fish we are about to eat was caught this morning. We're on the island of Koločep, in the Elaphiti Islands just off Dubrovnik in Croatia. Everything is relaxed and slow-paced. We sailed here, though there are regular ferries from the Old Town. Tying up at the tiny pier, beside a row of colourful wooden fishing boats, we find a man tidying up a fishing net on his small blue boat. Fishing was good this morning, he tells us. His catch is a few kilos. At Škerac (+385 91 576 1165), we tuck into octopus, anchovies and capers, followed by the dorada with a healthy feast of mixed vegetables, salad and chargrilled aubergine. This is typical Dalmatian cuisine - nearly every restaurant in this part of coastal Croatia serves fresh fish with whatever is in season. The dorada is bursting with flavour I never knew fish could have - in the Adriatic Sea, the salinity and cleanliness of the water helps make seafood so tasty. Everything is local. The wine, Zlatna vrbnička Žahtina, is from Krk island further north. At Šipanska Luka on Šipan island, the largest of the Elaphitis, we dine at Konoba Kod Marka (+385 20 758007), started by Marko Prizmic when he retired as a chef in Dubrovnik. He wanted to create a relaxed corner that people could escape to from everyday life. Now his son, Dino, runs the tiny waterside restaurant which looks over a quiet bay where life is so laid-back, every day seems like Sunday. There's no menu here. You just say if you want fish or meat. 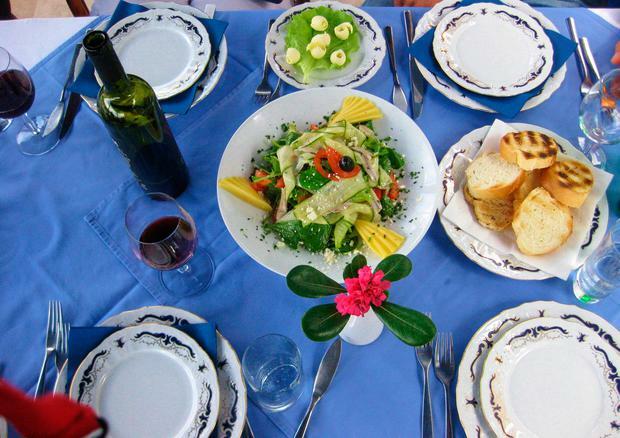 We go for fish, and are soon enjoying fresh anchovies, tuna carpaccio and octopus cakes, followed by the main course - a delicious shrimp and vegetable pasta. Back in Dubrovnik's Old Town, the atmospheric walled city with its tiny churches and palaces, tourist traps have their usual signs out, boasting of the best views and menus. 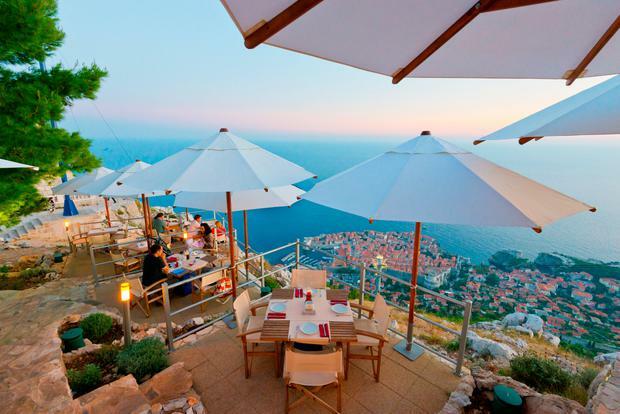 Dubrovnik's culinary scene has been evolving with the global growth of food tourism, however. This is my fourth visit, and in the past couple of years a host of new restaurants has sprung up offering everything from Asian/Mediterranean fusion to creative twists on Mediterranean cuisine, and the city now has its own food festival. A food tour gives me an insight into the culinary traditions and less touristy dining options. "These salted and marinated anchovies have been kept in oak barrels for 18 months with no light," says Marija Tosić, my guide with Dubrovnik On Plate. "It's the traditional way to prepare them." In Marco Polo restaurant (marcopolo-dubrovnik.com), down a tiny stone street in the Old Town, Marija talks me through each dish - the dried, smoked tuna is salty because it was dried near the seaside; the oysters are from Ston, a town 30 miles north which has the oldest oyster farm in Europe and 5.5km-long walls; the ham was dried in the Bura northern wind. Next is Kopun (restaurantkopun.com), an outdoor restaurant specialising in capon (castrated rooster), where we tuck into a platter of marinated prawns, Croatian cheese with rosemary and olive oil, Kulen (a dried sausage), octopus salad, Dalmatian ham and tuna - a blend of many Croatian flavours. We also visit Vina Skaramuča wine bar (dingac- skaramuca.hr/en), before ending with coffee and cake at Pupica patisserie (pupodubrovnik.com). In Dubrovnik, I taste everything from black risotto to mussels, clams, scampi, cuttlefish and squid. I visit the market where the chefs plan the day's ingredients. I eat in restaurants outside town with tables so near the sea, the warm Mediterranean water practically laps onto the restaurant floor. But it's at what seems the most unlikely place that I discover some of the city's best food - an octopus burger at Barba (BoŠkovićeva 5), a tiny seafood street-food place up a narrow street. Here, owner Miho Obradović explains his restaurant's name. A barba is a fisherman, he says - "the person who knows good fish, good olive oil and good weather". Miho's grandfather Ivan was a barba, his father is head of the fish market and Miho (32) himself studied marine biology, so he knows his fish. Everything on the menu, from the tuna paté to the marinated shrimp, is bursting with flavour. There's a sardine burger and a shrimp burger, but the octopus burger is the number one. Other restaurateurs said he was crazy when he first opened two years ago, Miho says - but the following year, he sold nearly 12,000 octopus burgers and now they all think it was a great idea. Dubrovnik has every type of cuisine for every budget - I am sure I could have found fancy foams and infusions, but having started by appreciating the traditional fish, it's nice to see someone taking the seafood tradition into the future. Find out where locals eat, sample traditional food and wine and learn about local culinary traditions on the Dubrovnik On Plate gourmet tour in the Old Town. It takes three hours (minimum 2 people; maximum 12) and costs €60pp, including wine. Tours run April to November. See dubrovnikstory.com. The Dubrovnik Good Food Festival runs from October 20 to 23 with special menus in 30 restaurants, dinner with a celebrity chef, tastings, gastro tours, workshops on preparing local delicacies, a daily food fair and live music. This is the festival’s second year. See tzdubrovnik.hr. Looking for a takeaway? Buy some local delicacies – drop into the open-air market in the Old Town (Monday to Saturday, 7am to 1pm, Gundulic Square) for everything from fresh and dried fruit and vegetables to candied almonds, arancini (candied orange peel), jams, honey or golden olive oil. Flat shoes - many of the Old Town's streets are uneven or the stones get slippy and there are lots of stone steps. Leave woollies at home - the coldest it ever gets during winter is 10°C - and bring a water bottle to fill up at Onofrio Fountain near Pile Gate. Aer Lingus (aerlingus.com) flies up to five times weekly from Dublin to Dubrovnik from €59.99 each way, including taxes and charges. The service runs until November 4 and recommences on March 26, 2017. Dubrovnik packages are also available from several Irish tour operators and travel agents. The Bellevue Hotel (doubles from €162) is a 10-minute walk from the Old Town; it has its own beach and every room has a sea view. See adriaticluxuryhotels.com. We sailed to the Elaphiti Islands with Huck Finn Adventures (huckfinncroatia.com; three-day trips from €370pp).